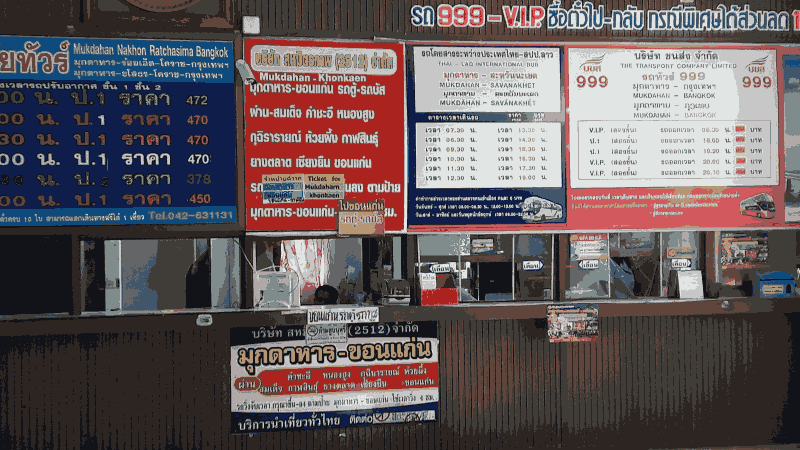 UPDATE: Pattaya – Bangkok – Savannakhet Visa Run January 2019. Again, no changes to visa requirements and procedure, but some bad planning meant I had to go via Bangkok again. Scroll down the page for details. UPDATE: Pattaya – Bangkok – Savannakhet Visa Run March 2017. There were no changes to requirements at the Thai Consulate in Savannakhet. The details on this page are from my 2015 visa run, but on my 2017 visa run I could not get a seat on the Yellow Bus, so please scroll down to the bottom of the page for details of my alternative route. A little more about the “Non Immigrant ‘O’ based on marriage” from Savannakhet, Laos. It was mentioned in the comments section that this article is lacking a little clarity. So please just let me tell you a little more about this visa. This visa is a non immigrant ‘O’ visa, available as multi entry or single entry. You may apply for this visa if you are married to a Thai. On entry to Thailand you are permitted to stay 90 days. When your 90 days are finished you must leave the country, or visit your local immigration office accompanied by your wife, with appropriate documents, and apply for a 60 extension of stay. If you have multi entry you can exit, and re-enter Thailand for a further 90 days. Please note: You can only apply for a 60 extension of stay 1 time per entry, you can not apply for 2 consecutive extensions without leaving the country. This was my second visa run from Pattaya to Savannakhet, and once again I obtained a non-immigrant ‘o’ 1 year multiple entry visa. Different circumstances and schedule than my previous visa run, this time there is no same day application and processing in Savannakhet. And my traveling companion must be out of Thailand on the Sunday to avoid being on overstay. So that means we don’t have to rush, but it does mean we have 2 days in Savannakhet. If you’re considering doing the Pattaya to Savannakhet, Laos visa run this post may provide you with a few valuable hints and tips. WE booked a VIP seat on the Saturday night 9.30PM Pattaya to Mukdahan Yellow Bus 4 days in advance at the North Pattaya Road bus terminal, VIP tickets cost around 680 baht. If you need extra leg room book a front seat on the bottom deck, right hand side. The bus departed on schedule at 9.30PM and arrived in Mukdahan at 9AM on Sunday morning. Note: you can purchase a Yellow Bus ticket up to 7 days in advance. We were in no rush, so we hung around the Mukdahan bus terminal and found a little restaurant which made a decent pat krapao gai. We took the 10.30 Mukdahan to Savannakhet international bus. You can buy tickets for 50 baht inside the Mukdahan bus terminal, the bus departs every hour, at half past the hour, but you need to arrive at the border before 6PM or the border may be closed. Once at the border you pass through Thai immigration / passport control and then board the bus again, so make sure you keep your ticket. The bus will then take you over the bridge to Laos immigration checkpoint / passport control. On the left side, just before passport control, you will see the Laos visa kiosk. Take an application form and “arrival/departure card”, fill in the application form and hand it back with 1 passport photo and either 35 U.S dollars or 1,500 baht, fill in the arrival card complete with an address in Laos, a hotel or guest house address is sufficient. Now you can proceed through Laos passport control. Once through you have the option of taking the same international bus to Savannakhet bus terminal (if one is still waiting), or you can take a taxi to a hotel or direct to the Thai consulate, taxi prices are around 200 baht per person, you can barter for a discounted rate if you are sharing. We took a taxi for 150 baht each to the Avalon Residence in Savannakhet (HotelsCombined partner link), which incidentally is only a very short walk from the bus terminal, but we didn’t know that at the time. The “walk in” room rate at the Avalon was 680 baht, you can find cheaper guest houses in Savannakhet but I think the Avalon was good value for money. The rooms were spotlessly clean, air-conditioned, and had a hot shower, fridge and T.V. The Avalon is just a 20-minute walk from the Thai consulate, or you could take a tuk-tuk. Because of the circumstances we had 2 days to hang around Savannakhet, the Thai consulate opens for visa applications between 9AM and 11AM, Monday to Friday. Please note, the Thai consulate is closed on Thai and Laos public holidays, so make sure you take a look at the calendar on their website, http://www.thaisavannakhet.com/savannakhet/th/consulate/officehours/. There really is very little to do in Savannakhet, fortunately on my first visit visa applications were being processed on the same, so I only had a matter of hours to hang around before collecting my passport. We spent a lot of time walking the streets looking for drinking holes and restaurants, and managed to find a couple of nice restaurants, one of which did a great pizza. But by far the best spot to kill the time was on the riverside. We took a tuk-tuk for 100 baht to the riverside then walked a short distance until we found a rather ramshackle place just past the ferry immigration control. The beer was cheap, around 40 baht for a large bottle of Beerlao, and the riverside location had a great view across the Mekong river. Forget nightlife in Savannakhet, apart the handful of restaurants and bars there is not much else. Yes, if you scratch beneath the surface there are “knocking shops” but don’t expect discos and girlie bars. Pattaya, this most certainly is not. The young man behind the desk at the Avalon Residence will provide you with a map and highlight noteworthy bars and restaurants if you ask him. On Monday morning we made a 20 minute walk to the Thai consulate, there were lots of opportunities to take a tuk-tuk, but it’s a rather pleasant walk in the early morning. Located at the side of the consulate building there is a shed where you can collect a Thailand visa application form, for a mere 80 baht the staff there will fill in the form for you. I would advise you to fill the form yourself and then just ask them to inspect it and make sure everything is correct, still worth the 80 baht. Once your form is filled and passport photos attached, take it along with the necessary documents and fee, then join the queue. Once at the consular counter hand over your paperwork and appropriate fee, the consular staff will check your documents and hand back the originals, you will then be handed a piece of paper with your customer number, don’t lose this because you need it to collect your passport the next day. Note: visa applications are only accepted between 9AM and 11AM, and only on weekdays. Now you have a full day to kill, so off to that little riverside bar/restaurant. You can collect your passport the next working day between 2PM and 4PM. Join the queue, hand in your number and take your passport, remember to check and make sure everything is correct before you leave the counter. You can arrange a tuk-tuk to take you to the consulate, wait for you there and then take you to the Laos border immigration control. We had one take us to the consulate and then on to the border for about 200 baht. Once you pass through Laos passport control, go to the Savannakhet to Mukdahan bus kiosk and purchase a ticket. Board the bus and ride to Thailand passport control at the Thai side of the bridge. Get off the bus, collect an arrival/departure card and fill it in. Now join the queue for passport control, hand in your passport with the arrival/departure card, it usually takes a minute or more for the immigration officer to inspect and stamp your passport. When he hands back your passport you MUST CHECK TO MAKE SURE YOU HAVE THE CORRECT ENTRY STAMP. Once through passport control board the bus again to Mukdahan bus terminal, if you miss your bus or it is full just wait for the next one. If you did not purchase a return ticket to Pattaya when you arrived at Mukdahan, you can buy one at the Yellow Bus ticket office, just across from the bus terminal. As I experienced myself on my previous visa run to Savannakhet, there is no assurance you will have a VIP seat. When we arrived in Mukdahan from Pattaya we purchased tickets for the Tuesday 6.30PM bus back to Pattaya. We could have booked an earlier bus but I think it’s best to allow yourself lots of time just in case there are any hiccups. The Yellow Bus terminal is located on North Pattaya Road, the same terminal which operates buses to Bangkok and Bell Travel airport bus. You can purchase bus tickets up to 7 days in advance. Depending on the route, the bus journey from Pattaya to Mukdahan takes between 11 and 13 hours. If you are planning to travel overnight and arrive at the Thai consulate before 11AM, make sure you ask what time the bus arrives in Mukdahan so you can ensure you have sufficient time to get to the consulate. You can purchase your return ticket to Pattaya in advance at the Mukdahan bus terminal when you arrive in Mukdahan. Mukdahan to Savannakhet bus tickets can be purchased in the Mukdahan bus terminal. The journey from Mukdahan to the Thai / Laos border passport control takes around 15 minutes. Once through Thai passport control you must board the bus again to the Laos border passport control. A Laos visa costs 35 U.S dollars or 1,500 baht. The Thai consulate is open for business on weekdays, you can not apply for, or collect visas on weekends or public holidays. Vis applications can only be made between 9AM and 11AM. Passports can only be collected the next working day between 2PM and 4PM. Original documents will be inspected and handed back when you make your visa application. Original marriage certificates in English or Thai are accepted, certificates in other languages may have to be translated and notarized. We never had any problem using Thai baht anywhere in Savannakhet, from tuk-tuks to corner shops, but they always gave us the local currency (kip) as change. As you know, I applied for a non-immigrant ‘o’ visa based upon marriage to a Thai. The documents required at the time of my application (Monday 14th December 2015) can be seen on the list below. All visas are granted at the discretion of the consular officer, and additional documents may be asked for if the officer believes they are necessary. In such case, having children here in Thailand I also take along copies of my children’s tabien bahn (house book) page, and copies of their birth certificates. Documents required for non-immigrant ‘o’ visa based on marriage to a Thai, from Thai consulate website, December 19th 2015. 1 completed application form with 2 passport photos 3×4 centimeters attached. Copy of marriage certificate, front and back, as on the original. NOTE: I took 1 copy signed by wife, and 1 copy not signed. Copy of passport front page (photo page), signed by you. Copy of wife’s house book (Tabien Bahn), signed by wife. Copy of wife’s ID card, front and back, as on the original, signed by wife. Visa fee, 2000 baht for single entry, 5000 baht for multiple entry. IMPORTANT: This information applies to me as a British national living in Thailand, being married to a Thai, and being the father of 2 children, and is correct at the time of writing (December 19th 2015). Thailand visa rules and regulations do differ from one nationality to another, and the rules and regulations are constantly changing, sometimes quite literally overnight. So it is most important that you check to confirm the requirements apply to your nationality and to your own circumstances. Please check the Thai consulate website http://www.thaisavannakhet.com/savannakhet/th/index.php before applying for a visa. You may also find valuable up to date information on forums such as Thaivisa.com. A nice place to chill out on the riverside at Savannakhet. The Mukahan to Savannakhet International bus ticket kiosk at Mukdahan bus terminal. The Thai consulate building on the right hand side. On the left hand side is the shed where you can get your visa application form, and for 80 baht the staff will complete the for for you. The Yellow Bus ticket office at Mukdahan bus terminal. HotelsCombined.com hotels in Mukdahan (partner link). HotelsCombined hotels in Savannakhet (partner link). A last minute decision to do the Savannakhet visa run meant I once again missed the chance to book VIP seats on the Yellow Bus from Pattaya. I decided to try the Sombat Tour Bus – and booked a seat for 2nd January through 12go. I decided to to buy a ticket to Morchit from North Pattaya Bus terminal on the day, I arrived at the terminal at 3PM and due to it being the New Year period I could not get a seat on the bus until 5PM. This only gave me 30 minutes to make the 2 kilometer journey from Morchit to the Sombat Tour terminal to catch my 8.30PM bus – and left no room for error. So I decided to take a taxi to Morchit. That’s a bad start and I’m already 1,800 baht (taxi fare) down. I made the bus no problem, which left Bangkok at 8.30PM and arrived in Mukdahan at around 6.40AM. The Sombat Tour bus to Mukdahan is a single decker bus, there are no extra large VIP seats like those on the Yellow Bus or Sahapan bus – so it was a pretty horrible ride. I took the 7.30 Mukdahan – Savannakhet bus, cleared immigration, and arrived at the Thai consulate by about 8.40AM. As soon as I arrived in Mukdahan from Bangkok I bought a ticket for the return trip to Pattaya on the Yellow Bus. Unfortunately there were no VIP seats downstairs, and I have to say – unless you get the big VIP seats downstairs it’s going to an uncomfortable ride. I stayed at the Avalon Residence again: I made the booking through Agoda, and despite booking a room with a balcony they gave me a room in the annex building. There are no rooms with balconies in the annex building, and to be honest they’re a little bit gloomy, so very disappointed with that. In hindsight I should have tried the Aura Residence, it’s right next door to the Avalon, and has a nice little restaurant downstairs. Because there was no seats on the Yellow Bus from Pattaya I had to plan an alternative route via Bangkok. I booked the Sahaphan VIP bus through 12GoAsia (partner link), the bus leaves Bangkok Morchit bus terminal at 2030, and arrives in Mukdahan at 0610. NOTE: try to book as many days in advance as you can to ensure you get your preferred seat. I took the 1540 bus from North Pattaya Road Bus Terminal, and arrived at Morchit bus terminal at 18.40. Way too early, in hindsight I should have taken the later bus. 2 hours hanging around Morchit is not a comfortable experience, it’s hot, crowded and sticky. The Sahaphan bus stand is located in zone 3 at Morchit, it’s not easy to identify but if I remember rightly it’s rank 48 or 49. Once I found it I handed the attendant my 12GoAsia voucher, he highlighted the seat number and handed it back, the voucher then also served as my bus ticket. The Sahaphan bus arrived in Mukdahan at 0630, once there I purchased a ticket for the 0745 Mukdahan to Savannakhet bus. I also purchased my return ticket to Pattaya for the following day on the 1840 Yellow Bus, highly recommended if you want a comfortable seat downstairs.